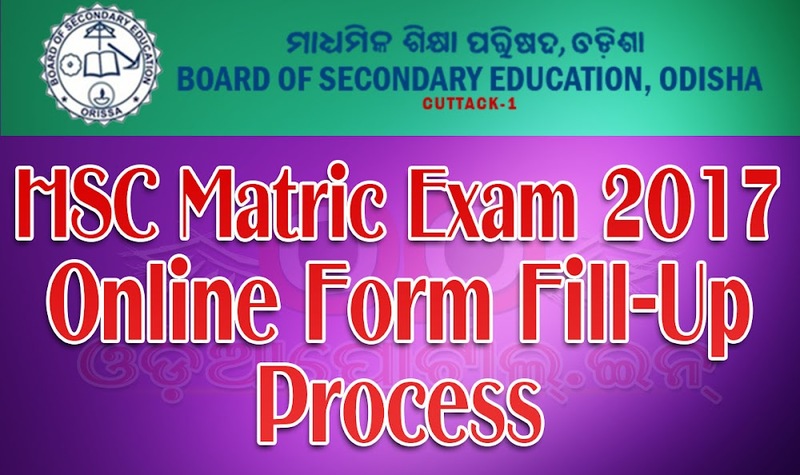 Board Of Secondary Education, Odisha going to conduct Online Form Fill-up process for Matric (10th) HSC Annual / Madhyama Examination 2019 from 26/11/2018 to 14/12/2018. Read following posts to know how to fill the form correctly without any mistake. For details instruction, please download the Printable Documents attached at the end of this post. Click on "APPLY ONLINE" button to fill the form. 1. The students of all secondary schools shall fill up their application forms for appearing at the Annual HSC Examination, 2019 through the Head of the Institutions of recognized schools who have enrolled those students during 2017. 2. The following category of school students can fill up their application forms for appearing at the Annual HSC Examination, 2019 whose authority to fill up the application forms shall be their Head of the Institutions. (iv) The candidates not coming under Sl. No.- c. supra will be eligible to appear the examination with the new course provided they come under Correspondence Course Regular after taking admission into the Correspondence Course of the Board. 3. The following category of Correspondence Candidates can fill up their application forms for appearing at the Annual HSC Examination, 2018 whose authority to fill up the application forms shall be the Deputy Secretary of concerned zones. (i) Correspondence Course Regular candidates of Annual/ Supplementary HSC Examination, 2016.
c. The candidates who have once admitted under correspondence course of B.S.E., Odisha and not coming under Sl. No.-3 (b) supra, shall not be treated under Correspondence Course Ex-Regular. These category of students if desire to fill up their forms may take fresh admission under correspondence course and appear the examination under Correspondence Course Regular category in the present course. Institution Heads shall be held responsible for entering wrong Appearing Code against any candidate. "The Regular students of SC & ST Category are exempted from paying the examination fee." a. The filling up of application forms shall be done through ONLINE mode only on visiting the website www.bseodisha.ac.in from 26/11/2018, 08.00 am onwards. 9. The Regular students of SC & ST Category are exempted from paying the examination fee. The Head of the Institutions are to verify in the online application, whether caste category already entered by them during the enrolment of these students are correct or not. They can edit the same if wrong caste category has been entered basing on the copy of the certificate produced by the students. 14. The Head of the Institutions are also to ensure that these candidates do fulfill the deficiencies by extra coaching etc, so that they appear the Supplementary HSC Examination in the said year under Regular category. 2. The authorities to Log In shall go through the General Instruction and Step by Step Instruction before filling up of the application forms for Annual HSC Exam., 2018. They will be held responsible for any wrong entry or wrong deposit of fee. They should also note that fee if once remitted to the accounts of the Board shall not be refunded at any cost. 3. The online application for filling up of application forms shall be available from 01/11/2016 08.00 am onwards on visiting the website i.e. www.bseodisha.ac.in. 4. On visiting the above website, Log In page shall be displayed on the screen. You can enter the application by entering the User ID & Password. 5. The User ID will be the school code and password is the same that has been used for enrolment of Class-IX students for appearing at the HSC Examination, 2019. The filling up of application forms can be done more than once. However if the head of the institution is filling up the forms for suppose, 20 candidates, he/ she has to complete the process and log in again to do the filling up of application forms for other candidates. This section contains information regarding the school which will automatically be displayed basing on the data submitted during enrolment of Class-IX students for appearing at the HSC Examination, 2018. However if some information needs to be edited, the same can be done and SUBMIT button to be clicked to move to the next section for filling up of the application forms for Regular and Ex-Regular students. [i] On clicking “Registration Regular” at the top of the screen, the data of students who have been enrolled during 2017 in Class-IX shall be displayed. [ii] The Head of the Institution is supposed to go through the data shown on the screen. He has to read the name of the candidates one after other and finalise, who shall fill up the application forms out of the name of candidates shown on the screen. [iii] Once the candidates at [ii] above is finalised, Head of the Institution has to select the Internal Assessment grades for WE, AE & HE against each candidate and thereafter select the candidates at the extreme right box  and click Save & Next button, so that the candidates are shifted and displayed under the section “Registered Student List for Edit”. This can be done for one candidate or more number of candidates at a time. [iv] Likewise all students those shall be selected, will be deleted from this section and shall automatically be displayed under the section “Registered Student List for Edit”. [v] After completion of registration of Regular candidates you can click “Registration Ex-Regular” to go for registration of Ex-Regular candidates. [i] Before going for registration of Ex-Regular candidates, the Head of the Institution should keep with himself ready with the Roll Nos. and year of examination of those candidates who come under this category. [ii] Enter Roll No. and year of the examination, so that data of the candidate will be displayed on the screen. [iv] If the candidate comes under the appearing code “All Subject (A)”, his/her language subjects should be chosen/ entered again from the drop down and photograph & scanned signature be uploaded. Thereafter click “Save & Next” button, so that this particular candidate moves under the section “Registered Student List for Edit”. The similar procedure shall be followed one by one for registration of more than a single candidate. [v] If the candidate comes under the appearing category “Compartmental (C)” his/ her appearing subject(s) have to be entered from the drop down and photograph & signature have to be uploaded. Thereafter click “Save & Next” button, so that this particular candidate moves under the section “Registered Student List for Edit”. The similar procedure shall be followed one by one for registration of more than a single candidate. [vi] If on entering the Roll No. & Year of the Examination the data of the candidate is not displayed on the screen, the Head of the Institution has to approach Central Office, Cuttack to fill up the application form of that candidate within the stipulated period. [vii] After completion of the filling up of application forms for the all ex-regular candidates click “Registered Student List for Edit”, so that all candidates who have filled up forms shall be seen on the screen. [ii] In case some other information apart from that mentioned at [vii] is required, the Head of the Institution has to approach Central Office, Cuttack for effecting necessary correction. However this should be completed within the stipulated period for filling up of application forms. [iii] After completion of edit of all information, the Head of the Institution shall move for “Payment”. [iv] On clicking the payment option at the top a consolidated statement of accounts for fee payment will be displayed on the screen. Take a print copy of the same as shown below on clicking “Ctrl + P”, so that the same amount has to be entered in the SBI Collect software. [ii] Click “Click Here to Pay Application Fee” for making payment through SBI Collect, the process of which is well known to you, it can be done either through online or offline mode. In offline mode the DU number will be printed on the Pre Acknowledgement Payment (PAP) form and the same can be known after payment through online mode. [iii] It is most important to note that while entering the total amount of fee in the SBI Collect, the amount should match with the total amount displayed earlier as shown at [i] above. In case of mismatch, you will not be able to proceed further for which the filling of forms will be a total failure. [iv] After payment is made, one has to wait for at best 12 hours for authentication of payment. [v] Once payment is made, you have to log out and after at best 12 hours re-visit the website again, enter the DU Number and proceed for “Declaration” and downloading of “Descriptive Roll Sheet”. [vi] Once DU number is entered and submitted, no further correction can be effected. Hence it is advised to effect all necessary correction when you at the stage “Registered Student List for Edit”. 1. The following certificate and declaration have to be given by the Head of the Institutions in this section. Certified that, I have entered the data of the students correctly and have preserved the copies of caste certificates of SC & ST students which may be required at any time by the B.S.E., Odisha for the purpose of audit or for any other purposes. I do hereby declare that, I shall report the name of students who have filled up application forms and could not fulfil the eligibility condition of percentage of attendance as on 31st January, 2017/ pre-board appearance to our District Education Officer by 2nd February, 2017 for cancellation of their candidature. I do hereby declare that, the information submitted by me are correct and based on official documents of the school. The Ex-Regular students registered by me are eligible for appearance at the Annual HSC Examination, 2018. The appearing code of the Ex-Regular candidates i.e. All “A” or Compartmental “C” have been correctly entered by me. The correction of the data in favor of the registered students, wherever required have been effected and no further correction is required. The photograph of the candidates in the database have been duly uploaded which is genuine. I shall be held solely responsible for any incorrect information submitted in this application. 2. After going through the Certificates and Declarations given above, click the box at the left hand corner, so that your signature and final submit button will be displayed confirming that you fully owe to the certificate and declaration given. 3. Now click “Final Submit” button so that “Descriptive Roll Sheet” will be displayed on the screen. Take a print out of the same and log out. 4. If the Log In authorities require some more students for registration, they can very well follow the similar procedure and do the form fill up work. If any problem occurs, please contact us via below comment box powered by Facebook. We will provide advice / help as soon as possible. how Can I know password and how can I Login this site. If student name is wrong then how can it correct.